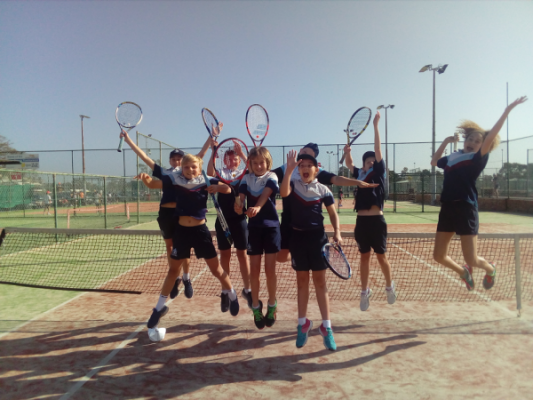 The mighty SCAS Tennis team has again been victorious at HRIS in Newcastle today making it three years in a row! Congratulations to Tom Marchant who was named the Year 5 and Under Boys champion and to Daisy Mills who played Grace Curran in the Year 5 and Under Girls final – this is the first time two SCAS students have played against each other in a tennis grand final! Daisy was named the Champion, with Grace runner-up. Well done to both girls. All three students will now represent HRIS at the CIS Championships to be played next year at The King’s School, Parramatta. The remainder of our team, Michael and Robbie Vandoros, Jack Lund, Ella Carroll-Fitzpatrick and Ban Rashdan, played extremely well with 6 of our 8 players making the play offs. As usual all players showed exceptional behaviour and sportsmanship. A big thank you also to the parents who attended and supported the team.